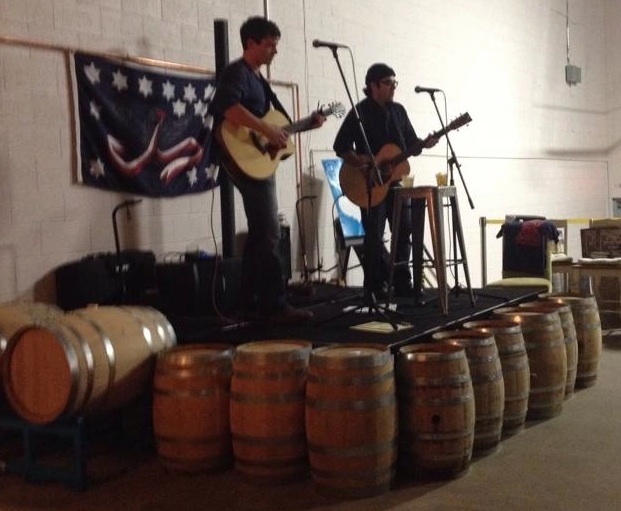 They dim the lights in the Wigle Barrelhouse just as the music is starting, so that the soft twang of an acoustic guitar and a mandolin sound softer still, muffled and sweet. The oak barrels lining the room – all four walls, stacked on their sides to the ceiling, propping up the cocktail tables – take on a slight glow. There’s a small boy pushing a bright plastic truck around on the concrete floor, and I’m sipping an old-fashioned, smiling, pleased with myself. The old-fashioned is made from Wigle’s own rye whiskey, and though I usually prefer bourbon, the hints of vanilla, maple, and brown sugar remind me enough. Aromatic and pomander orange bitters, and a twisted orange peel. The drink is perfect: cool and warm, sweet and biting. Alicia reads crescendos of lines about Ernestine Rose and the syrup-sticky things men whisper at bars. Jessica describes the slime of grape skins beneath her feet, stomping juice frantically, coming home. We order another round of cocktails, gathering in clusters around oak barrel tables to swap our own stories, to clink glasses. Wigle is a grain-to-bottle distillery, using local organic grains they mill on site, then distill in traditional copper pots. The spirits age in charred oak casks for a year, developing flavors based on the air, the water, the people of western Pennsylvania. In John’s short story, a marriage-to-be falls apart—then lives, even if briefly—over chicken piccata. Suzanne reminisces for the days of at-home, small-batch food culture, hopes for, goes to find, a new version of pickling and canning and distilling, one that has stretched outside our grandmother’s kitchens. One that honors its past but moves forward. Wigle is named for Philip Wigle, a farmer and what we might now call an artisanal small-batch whiskey distiller. In 1794, Wigle was sentenced to hang for his role in sparking the Whiskey Rebellion. The insurrection, really, was a tax protest beginning in 1791, against the imposition of an excise tax on distilled spirits, of which whiskey was the most popular. Since most whiskey was distilled by farmers using surplus grain and corn to earn extra income, the western frontier regions of brand-new country were accustomed to having things there own way. Many of the resisters were war veterans who believed they were fighting for the principles of the Revolution. Philip Wigle took up arms against the tax collector who came to his door – one of many who did so in the area. When a U.S. Marshal arrived in western PA to arrest those who had refused to pay, more than 500 armed men attacked the federal officials. President George Washington responded with peace negotiators, then led a state-government-formed militia into the region. There was no confrontation – the armed men went home before the militia arrived, and Washington would later pardon many, including Wigle. Distillers continued refusing to pay the whiskey tax, which President Jefferson eventually repealed. The Wigle distillery is a new beginning, bringing craft spirits back to the region, and in some ways, that’s what we celebrated at the Barrelhouse the other night. A gathering of writers remembering the past: the heroines and geographies of our collective heritage. We raised our glasses to their memory, sipped the stinging warmth of a legacy mixed from honor and violence, and hope that, by sharing, it goes down smooth.